10 May 1918 - adm 66th Stationary Hosp Jerusalem - trans 36th Stationary Hosp Gaza 14 May - trans 31st Gen Hosp Abbassia 19 May - enteritis. 20 Jul 1918 - adm 47th Stationary Hosp Gaza - trans 44th Stationary Hosp 7-22 Aug - malaria. Alfred John Caswell was the son of Mark and Ellen Caswell. He attended Albury School. Two brothers, George Arthur and William, were killed in action. Three further brothers served in World War One - Frank, Henry and James Walter. Alfred, born at Timaru on 23 January 1897, was one of 17 children of Mark (1845-1933) and Ellen (1854-1938 nee Fletcher) Caswell. His parents had farmed at Springbrook, just south of Timaru, before moving to Holme Farm, Albury. Alfred was educated at the Albury School where he attained Standard 6 level, and later became an apprentice plumber to Hunt & Curry Timaru. Prior to the war Alfred had been a volunteer in the Army Service Corps and enlisted on 30 April 1917 into the NZ Army Service Corps, after he had turned 20 years of age. He was described as being single, Anglican, 5 foot 10 inches tall, chest measuring 33–36 inches, of fair complexion, brown hair, grey eyes, and weighing 146 pounds. His mother, Mrs Ellen Caswell of Holme Farm (later of School House Upper Waitohi, and then Pleasant Point), was nominated as his next of kin. Driver Caswell left with the 32nd reinforcements for Suez Egypt, from Wellington on 13 November 1917, aboard HMNZT 98 SS Tofua, arriving at Alexandria on 21 December. On 6 January 1918 Alfred was posted to 6 NZASC and then, on 7 March, reposted to the NZ Mounted Rifles in the field. A few months later, on 10 May, he was admitted to the 66th Stationary Hospital, Jerusalem with enteritis. He was transferred to 36th Stationary Hospital Gaza on 14 May, and further transferred to 31st General Hospital at Abbassia on 19 May. On 4 June he was sent to the Convalescent Depot and then discharged back to his unit on 9 June. Almost six weeks later though he was admitted to the 47th Stationary Hospital at Gaza 20 July with malaria. Transferred to 44th Stationary Hospital on 7 August, he was not discharged back to his unit until 22 August. The following year, on 20 June 1919, Alfred was promoted to temporary Corporal and posted on 26 June from the NZMR to No 4 Coy NZ ASC. He relinquished his though on 13 September 1919. During this time his units had been involved in the Sinai and Palestine campaigns. Finally on 14 September 1919 he left Egypt aboard SS Ellenga, and arrived back in New Zealand on 12 October, and was immediately discharged as physically unfit on account of illness contracted on active service. This same month he married Miss Lavinia May Deans (1896-1978). For his service, Alfred was awarded the British War Medal and Victory Medal. Alfred returned to Timaru where he went back to his trade of Plumber, and he and Lavinia went on to have three children: Eunice, Valmai Alfreda and Douglas. On the outbreak of the Second World War Alfred re-enlisted into the 18th Company NZ Mounted Rifles, and entered camp 1 August 1940. He served on home service until being transferred to the Home Guard on 20 March 1942. The couple remained in Timaru where Alfred died on 3 February 1959, and is buried in the Timaru Cemetery. Five of Alfred’s brothers also enlisted in the war. Private William Caswell (no.17/382), NZ Veterinary Corps, was killed in action on 23 June 1917 and is listed on the Messines Ridge (New Zealand) Memorial, Messines Ridge British Cemetery, Belgium. Private George Caswell (no/.6/4008), Canterbury Infantry Regiment, was killed in action 21 September 1916 and is buried in the Caterpillar Valley Cemetery, Longueval, France. Trooper Francis Caswell (no. 11/2055) served with the NZ Field Artillery. Trooper Henry Caswell (no. 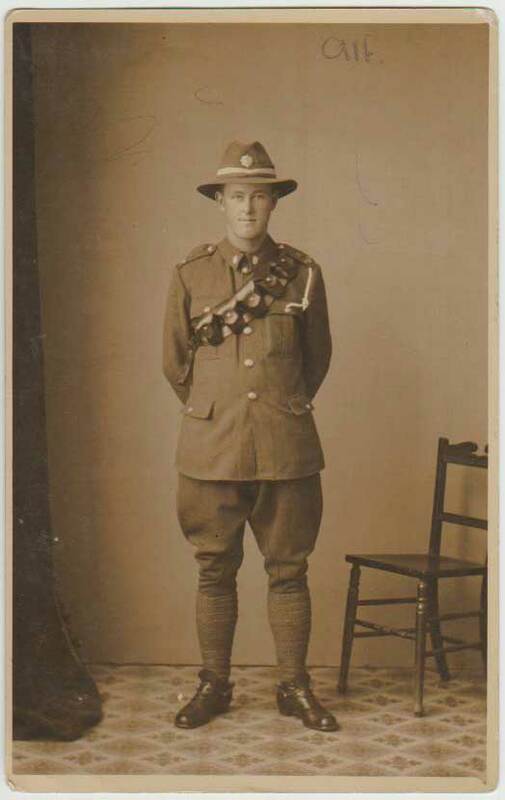 7/29) served with the Canterbury Mounted Rifles and Trooper James Walter Caswell (no. 17/380) also served with the NZ Veterinary Corps.